It was announced today that Kanjani8 will be releasing an Eito Ranger Movie! According to this article, the movie starts filming on the 6th and will be released at the end of July. This is another one of Kanjani8’s releases in their 8 year anniversary line up. The plot revolves around a legendary hero called “Captian Silver”, who is said to be played by Tachi Hiroshi, and the director is Tsutsumi Yukihiko (who’s directed BECK, Ikebukuro West Gate Park, Stand Up!! and SPEC and many others). That is all that is known about the movie at this point, but I will be looking forward to more updates once they are known! I am so excited for this release! 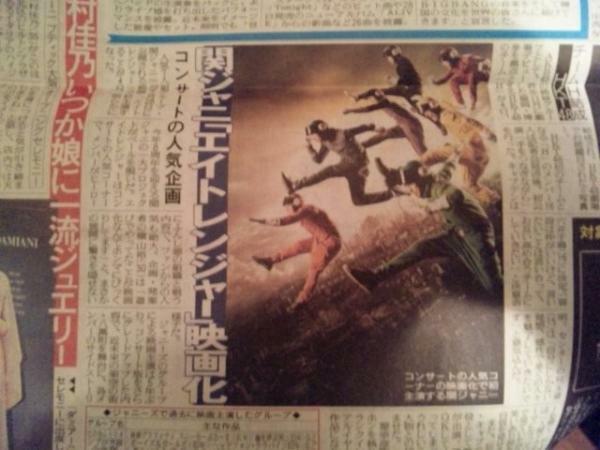 Kanjani8 said that the eito rangers would come back during their 8th year anniversary, but I never expected a movie! I expected just another eito ranger skit when they toured this year. Kanjani8 always manages to blow me away and top everything they have done before. Eighters have been wanting the eito rangers to come back since the last time they were seen in the Puzzle tour (though they were briefly seen during the 2009-2010 countdown when they did Arashi’s “One Love”). They came back 2 years later during this past year’s 2011-2012 countdown and that is when it was promised that the eito rangers would be back this year. Everyone was excited and this movie is what we get from it! I can say that I am proud to be an eighter and that Kanjani8 listens to the fans and manages to top what even the fans want somehow. Good Luck Kanjani8!